MABEL E. (FINLEY) CALLAHAN – of Woburn, March 31st. Beloved wife of the late Frederick L. Callahan Jr. Loving mother of Patricia A. McCue, her husband the late Daniel of Woburn, Maureen L. Fucarile of Stoneham, Frederick L. Callahan III of Woburn, Daniel T. Callahan, his wife Maureen of Bradford, Kathleen E. Clifford of Woburn, Kevin J. Callahan, his wife Rhonda of Haverhill. Cherished “Grammy” of 20 and great-Grammy of 14. A Funeral Mass will be Celebrated in St. Anthony Church, 851 Main Street, On Saturday, April 7th at 10. Interment in Woodbrook Cemetery. Relatives and friends are invited to call Friday, April 6th from 4-8 p.m. Remembrances may be made in Mabel’s honor to the James L McKeown Boys & Girls Club of Woburn, Charles Gardner Lane, Woburn, MA 01801. For directions or to leave an online condolence, please visit www.lynch-cantillon.com or Facebook under Lynch-Cantillon Funeral Home. 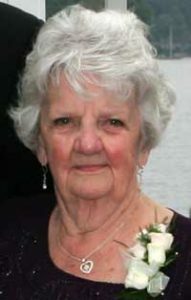 Mabel E. (Finley) Callahan, a long-time resident of Woburn, passed away peacefully, surrounded by the love and devotion of her entire family, Saturday, March 31st, at the Sawtelle Family Hospice House in Reading, The beloved wife of the late Frederick L. Callahan Jr., she was ninety three years of age. Born in Boston, Mabel was the daughter of the late Patrick and Mabel (Taylor) Finley. At the age of twelve, Mabels family moved from Stoneham to the South End of Woburn. She graduated from Woburn High School, along with the Class of 42. Following high school Mabel began working at Beggs and Cobbs, Union Office, where she remained until she married. Shortly after high school, Mabel had met Fred Callahan, whom she married, bringing six wonderful children into the world. They devoted themselves to their children; attending all of the activities they were involved in and out of school. Summers were filled with day trips to different spots across the state and throughout New England. Sadly, Fred suddenly passed away in 1990. Mabel dedicated her life to her family, always putting them first, throughout the years. By the time the last child was all grown, the grandchildren began arriving! Grammy as she loved to be called, was an excellent baker, cook and whoopee pie maker! While her children were growing up and then the grandchildren all being a very important part of her life. Grammy always made sure there was an extra seat or two at the table for family, friends and neighbors. Holidays were her most favorite times of the year! All holidays were celebrated in the homestead right up until just recently. Every family member would be there and when she would be in her glory to be surrounded by her family! Grammy was the grandchildrens number one supporter, always! Attending dance recitals, sporting events, academic performances, always followed up with making them whoopee pies, topped off with her ever so famous milk shakes! When she turned seventy-two she began accompanying the family to First Night in Boston on New Years Eve. All throughout the years, Grammy/Mabel was a dedicated, kind, friendly, loving, selfless, and devoted mother, grandmother, great-grandmother and friend. Her big heart had a very special place for each one of her children, grandchildren, and great grandchildren , whom she loved, oh so very much; as they all have a very special place in their hearts for her. Loving mother of Patricia A. McCue, her husband the late Daniel of Woburn, Maureen L. Fucarile of Stoneham, Frederick L. Callahan III of Woburn, Daniel T. Callahan, his wife Maureen of Bradford, Kathleen E. Clifford of Woburn, Kevin J. Callahan, his wife Rhonda of Haverhill. Cherished “Grammy” of 20 and great-Grammy of 14. A Funeral Mass will be Celebrated in St. Anthony Church, 851 Main Street, On Saturday, April 7th at 10. Interment in Woodbrook Cemetery. Relatives and friends are invited to call Friday, April 6th from 4-8 p.m. Remembrances may be made in Mabel’s honor to the James L McKeown Boys & Girls Club of Woburn, Charles Gardner Lane, Woburn, MA 01801. For directions or to leave an online condolence, please visit www.lynch-cantillon.com or Facebook under Lynch-Cantillon Funeral Home. Your Mom was one lovely lady! And will be missed by many. Always a smile on her face. She was very proud of each of you! My Thoughts and Prayers are with the Family during this very Trying Time. So sorry to hear of her passing. Your Mom/Grandmother was always a special person – a pleasure to talk to whenever our paths would cross. May the many happy memories of special times with her bring you comfort and peace. Mabel was a wonderful neighbor to our daughter and adopted grandmother to our grandchildren Kyle, Betsy and Lauren Miller. We were prvleged to always visit her when we came from Atlanta to Boston at Christmas. She would be baking late on Christmas eve but always had time to stop and visit. We are honored to have known this great lady. My sincere condolences on Mabel’s passing. She was a wonderful, sweet woman & I thought the world of her. A wonderful women who will be missed by everyone, especially her loving family. Dear Marc – we are so saddened to hear of your loss. It sounds like she was surrounded by love and family. We know your heart feels broken but try to find comfort in all the beautiful memories you will carry with you forever. God Bless my friend. I am so sorry to hear the loss of such a wonderful women. Growing up as a child with you all, she was a big part of the swimming family. We all grown up, go seperate ways, but you never forget how close you all were as a family. Heaven gained a wonderful person. My condolences to you all. I am so saddened to hear the news of the passing of Mrs. Callahan; she was a wonderful lady and a very good customer of mine during my Brigham Ice cream days. She was always so pleasant and polite and always had a nice word to say about everyone. A true lady. Her family is in my prayers during this difficult time.